DailyMag is a WordPress magazine theme that will make your content pop and your readers stay for days. This guide will help you get started and set up in just a few minutes. From the Dashboard of your site, go to Appearance → Themes. Click the Add New button at the top of the screen. Click the Upload Theme button at the top of the screen. Select Choose File and find the .zip file of the theme, select it, and click Add, followed by Install Now. The theme will upload then ask whether you would like to Activate, view a Live Preview, or Return to Theme page. You can activate or view the theme from this screen or do it later in the Appearance → Themes screen. Automatic updates will enable you to know when bug fixes and updates have been pushed by the development team, and provide a notification in the WordPress Dashboard when they are available. The license key must be renewed annually to continue to receive bug fixes, updates. Be aware that if you have made any modifications to the CSS or PHP files and run an update, all changes will be blown away! We highly suggest if you want to make theme modifications to do so by creating a Child Theme. From the Dashboard of your site, go to UpThemes. Paste the License Key you received in the purchase email from UpThemes into the License Key field. Click Activate. You will see a green “active” marker if the license key was entered successfully. If not, please email support for assistance. Show your personality off and make your site reflect you. The DailyMag Theme offers a number of options to make your site unique from the Live Customizer. The Customizer can be found under Appearance → Customize. Set the Site Title, Tagline, and Site Icon for your WordPress site. Choose from seven layout options to set your Global Layout. Set a custom color for the Background Color. Add a custom Background Image to the site and specify its positioning and whether it should tile. There are three menu areas; primary, secondary, and social. Here you can set up the Menus from the Customizer if you like. Setup widgets in the five available zones. Choose Your latest posts to display posts on the homepage. Showcase articles to make sure they get the attention they deserve by setting featured content. Go to Appearance → Customize. Expand the Featured Content section in the Customizer. Add a word to the Tag Name field, we suggest using the word featured to keep things simple since this is for Feature Content. You also have several customization options here, you can hide the custom tag from displaying in post meta and tag clouds and to display tag content in all listings. Click the Save & Publish button and Close the Customizer. Go to the Blog Post that you would like to add, and add a tag using the custom word from Step 3 (we suggested using the word featured). Update the Post and head over to the homepage of your site to check out the super duper awesome Feature Content! The image that will show up in the Featured Content on the Homepage is whatever image that is set as Featured Image on a Blog Post. Open the Blog Post you would like to add to the Featured Content. Along the right side column you will see a Featured Image block, click the Set featured image link. Upload an image or navigate to an image in the Media Library. When you select the image you like press the Set featured image to confirm. Press the Update button to save any changes. Remember, the Blog Post must have the correct tag associated with it for the item to be displayed in the Featured Content. As you saw above in the Customizer you can set a layout for your entire site for the Global Settings. You can also change the layout of your Pages and Posts with the same seven options. Add menu items from the left side of the page. Check the box next to the menu you want to create within Menu Settings. Make sure to click Save Menu before leaving the page. Add all your favorite social icons to show people where they can find you. To the left of Menu Structure, click the Links tab. Enter the link to one of your social media profiles in the URL field and add whatever Link Text you like (Ex: Upthemes on Twitter). Click Add to Menu. Add any other social links the same way. In the Menu Settings section, check the box next to Social. There are two sidebar widget zones. The primary sidebar appears alongside the content of every page, post, archive, and search template. The secondary sidebar will only appear when you have selected a three-column layout. The main column width is 760 in the one-column (skinny) layout. The main column width is 1140 in the one-column (wide) layout. The main column width is 845 in two-column layouts. The main column width is 550 in three-column layouts. Sidebar width is 760 in the one-column (skinny) layout. Sidebar width is 1140 in one-column (wide) layout. 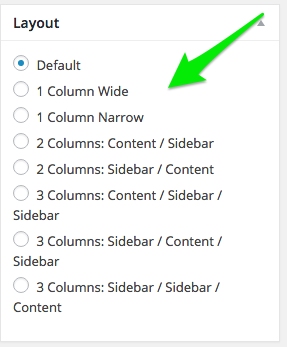 Sidebar width is 255 in two-column & three-column layouts. The featured image has a max width of 914 and max height of 487 in the one-column (skinny) layout. The featured image has a max width of 1520 and max height of 810 in the one-column (wide) layout. The featured image has a max width of 1690 and max height of 900 in two-column layouts. The featured image has a max width of 1100 and max height of 586 in three-column layouts.